1.How many PGY-1 positions are available in the 2018/19 CaRMS cycle? 2.Where do UBC-FHGV Psychiatry residents come from? 3.Does each UBC Distributed Psychiatry Program (Fraser-Greater Vancouver, Vancouver, Vancouver Island, North-Prince George, Research) come up with its own CaRMS candidate Rank Order List? 4.The CaRMS program application form online has so many choices for UBC Psychiatry. I’m from out-of-province and don’t know enough about the different “tracks” to make an informed decision at this point about which UBC Psychiatry Programs to apply to. Can I decide to add tracks (i.e. UBC-Fraser Greater Vancouver, Vancouver Island/Victoria) after I come to Vancouver in January or February for CaRMS interviews and learn more about the UBC “Distributed Programs”? 5.Where would I spend my PGY1 year if I am matched into the UBC-FHGV Program? 6.How do I apply to UBC-FHGV Psychiatry? 7.What are the strengths of UBC-FHGV Psychiatry? 8.What is the selection criteria used for applicants to UBC-FHGV Psychiatry? 9.Do I need to do a psychiatry elective for my application to be considered? 10.Do I need to do an elective at UBC-FHGV for my application to be considered? 11.Where exactly is the Fraser Health region located? 12.Where do most residents live? 13.Could I be assigned for training anywhere in the Fraser Health Region? It is a large Health Region and I am concerned about travel. 14.What do residents do in their spare time? 15.What is the call frequency? 16.What is the UBC-FHGV Psychiatry program position on resident health? 17.Is the UBC-FHGV Psychiatry program integrated with other UBC Psychiatry programs? 18.What are my opportunities for resident electives in the UBC-FHGV program? 19.I am thinking of doing a medical student elective in UBC-FHGV Psychiatry and I want more information about the program — Whom should I contact? 20.Can I contact residents currently in the program? How many PGY-1 positions are available in the 2018/19 CaRMS cycle? UBC-FHGV Psychiatry is accepting 6 new residents in the 2019 CaRMS Match. Where do UBC-FHGV Psychiatry residents come from? UBC-FHGV residents come from medical schools across Canada. The UBC Psychiatry Residency Program seeks outstanding students from all parts of Canada. There is no preference given to applicants from any particular medical school. Currently, UBC-FHGV does not accept applications from International Medical Graduates. Does each UBC Distributed Psychiatry Program (Fraser-Greater Vancouver, Vancouver, Vancouver Island, North-Prince George, Research) come up with its own CaRMS candidate Rank Order List? The CaRMS program application form online has so many choices for UBC Psychiatry. I’m from out-of-province and don’t know enough about the different “tracks” to make an informed decision at this point about which UBC Psychiatry Programs to apply to. Can I decide to add tracks (i.e. UBC-Fraser Greater Vancouver, Vancouver Island/Victoria) after I come to Vancouver in January or February for CaRMS interviews and learn more about the UBC “Distributed Programs”? This is a very frequently asked question. The answer is NO. UBC does not permit late CaRMS applications to any of our Psychiatry Residency tracks. Many students have regretted not applying to particular UBC Psychiatry tracks after they have come to Vancouver and heard from current residents about their very positive experiences in the Fraser Health-Greater Vancouver, Vancouver Island/Victoria or Prince George Tracks. We would STRONGLY RECOMMEND that students apply to ALL distributed UBC Psychiatry Residency Program Tracks and then make decisions on ranking after visiting Vancouver and learning more about our unique distributed Psychiatry Residency program from residents and teachers. Where would I spend my PGY1 year if I am matched into the UBC-FHGV Program? If you match into UBC-Fraser Health Greater Vancouver track, you will spend your entire PGY1 year at the Royal Columbian Hospital in New Westminster in Greater Vancouver, which is a highly-sought internship training site, and has been training PGY1 residents/interns for over 30 years. If you match into the UBC-Vancouver track, you will spend your PGY1 year at one of St. Paul ‘s Hospital, Royal Columbian Hospital or Royal Jubilee Hospital/Greater Victoria Hospital Society (GVHS) on Vancouver Island (accessible via ferry or plane from Vancouver). Assignment of Vancouver-track residents to these sites are made by the UBC Psychiatry Postgraduate Education office based on ballots filled out by the incoming PGY1 Vancouver-track residents before the start of the academic year (each is asked to rank all three sites in order of preference). There is coordination between the PGY1 Training Directors at each hospital site and the Residency Program Directors. How do I apply to UBC-FHGV Psychiatry? Please go to the CaRMS website for details on the process and documentation required to apply. Each UBC Psychiatry “Distributed Track” requires a separate application via CaRMS. Interviews for all UBC Tracks, however, occur on the same day in January or February. What are the strengths of UBC-FHGV Psychiatry? Please see the residents’ opinions on the strengths of our program on our website. What is the selection criteria used for applicants to UBC-FHGV Psychiatry? Elective Requirements: We encourage applicants to have completed at least one elective in our specialty. Do I need to do a psychiatry elective for my application to be considered? No, it is not necessary, but as with any specialty, it is recommended. We encourage applicants to have completed at least one elective in our specialty. Do I need to do an elective at UBC-FHGV for my application to be considered? No, it is not necessary to have done an elective at UBC-FHGV to be considered for a program position. A psychiatry elective in the Fraser Health region, however, is an excellent opportunity for prospective applicants to get to know our program, staff and residents. Where exactly is the Fraser Health region located? We are located in Greater Vancouver, and we encompass most of the suburbs of Vancouver. The Fraser Health Region extends from Burnaby on the eastern border of the City of Vancouver to Chilliwack. It is the largest Health Authority in B.C. with a population of 1.6 million. Our cities are the fastest growing in the province. 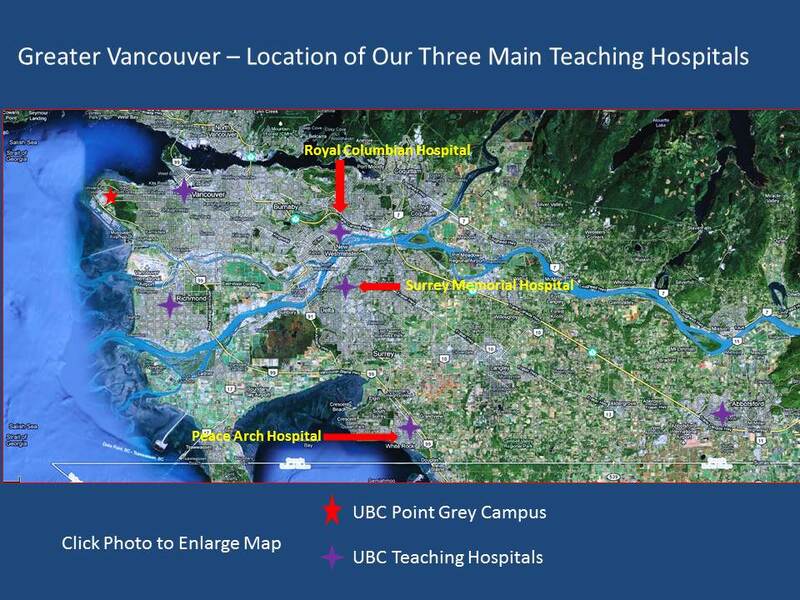 The main teaching hospitals are located in New Westminster (Royal Columbian – 15mins from Vancouver), Surrey (Surrey Memorial – 25mins from Vancouver), and White Rock (Peace Arch – 30mins from Vancouver). Our cities have the largest proportion of children and young families of any region in the province. In fact, 3 of the 4 largest school districts in B.C. are within the Fraser Health Authority. Please see our website map for further details. Because all teaching hospitals in UBC-FHGV are easily accessible by bike, car, or Skytrain, residents live throughout the Lower Mainland and Fraser Valley. This includes Vancouver, North Vancouver, Richmond, Burnaby, Surrey, Delta, Coquitlam, Port Coquitlam, White Rock, New Westminster, and others. Most of our current residents live in the City of Vancouver. Could I be assigned for training anywhere in the Fraser Health Region? It is a large Health Region and I am concerned about travel. No. Our training sites are clearly defined. All core rotations are based within our primary teaching hospitals, as described in this website. The Royal Columbian Hospital and Surrey Memorial Hospital, which are our two main teaching hospitals, are located minutes away from Vancouver. What do residents do in their spare time? There are countless things to do in the Greater Vancouver and Fraser Valley areas that cater to all tastes. Please see the ‘Top 5’ lists created by residents for an idea of their favourites. Also, there are many program-sponsored resident events that are scheduled throughout the year that bring residents together. These include: welcome BBQ, resident retreat, summer & winter socials, staff vs residents soccer match, journal club dinners, and other monthly social events. What is the call frequency? The call frequency in psychiatry rotations is standardized across all UBC Psychiatry sites and depends on the current year of residency. This can range from a maximum of 1:7-1:10. What is the UBC-FHGV Psychiatry program position on resident health? Resident health and well-being is of the utmost importance in our UBC program. The UBC-FHGV Psychiatry Program strives to create a culture of openness, collaboration and participation. Staff mentors are always available to discuss any issues that may arise during residency. The resources available to residents through UBC, Doctors of BC, PAR-BC and the College of Physicians are extensive. Is the UBC-FHGV Psychiatry program integrated with other UBC Psychiatry programs? Yes, UBC-FHGV is fully integrated with all other UBC Psychiatry streams. Academic day teaching occurs weekly at Vancouver General Hospital for all residents. All social events, academic rounds, and clinical electives are open to all UBC-FHGV residents, as well as residents from all of the UBC Psychiatry Residency tracks. What are my opportunities for resident electives in the UBC-FHGV program? Between 15-18 months of your psychiatry residency are available for electives. Residents can choose from electives available anywhere in the entire UBC Psychiatry Program. You are not restricted to elective choices in any particular part of B.C. You can even choose to do electives outside of B.C., or even outside of Canada. I am thinking of doing a medical student elective in UBC-FHGV Psychiatry and I want more information about the program — Whom should I contact? Please email Dr. Hameer for more details about the program. We look forward to hearing from you! Can I contact residents currently in the program? Yes, please email any resident-directed questions to fraserpsychiatry@gmail.com.